I appreciate how the regions of our great country use what they have to create different and sometimes unusual recipes. On a recent trip to Florida I discovered this delicious chicken salad. Of course they would use their ever present oranges in it. Easter in our home was very important because of the Christian meaning behind it. We grew up knowing how Jesus sacrificed his life for us. We went to church and Sunday school wearing our new Easter dresses including Easter bonnets and shiny new shoes. We sang all the familiar songs telling us of how Jesus arose from the dead and how that big heavy rock in front of the tomb just rolled away. They were happy songs and the choir always did such a good job after practicing for months preparing for this glorious day. Often mother would be playing the piano or organ and daddy would be up on stage with his Hawaiian electric guitar. Spring flowers including Easter lilies were everywhere. Sometimes my sister and I would have singing duets and as the years went by our voices improved and we could sound like the Lennon sisters the way our voices blended. It must have something to do with being related. That mysterious bunny must have gotten the solid chocolate rabbits and chicks from our paternal grandfather since he was a chocolate candy maker because it sure did have that Brevard Candy Kitchen taste. With Easter Sunday being so busy mother would make this egg casserole ahead of time so she could pop it in the oven and everyone would help themselves to breakfast. Basically you lightly scramble eggs in one skillet and make a chip beef gravy with or without mushrooms in another skillet. Layer the gravy with the eggs in the middle put it in the refrigerator or freezer and it’s ready when you are. Funny thing happened the other day when I took my little granddaughter, Deedy almost three, named for her mother’s sister, to the garden. 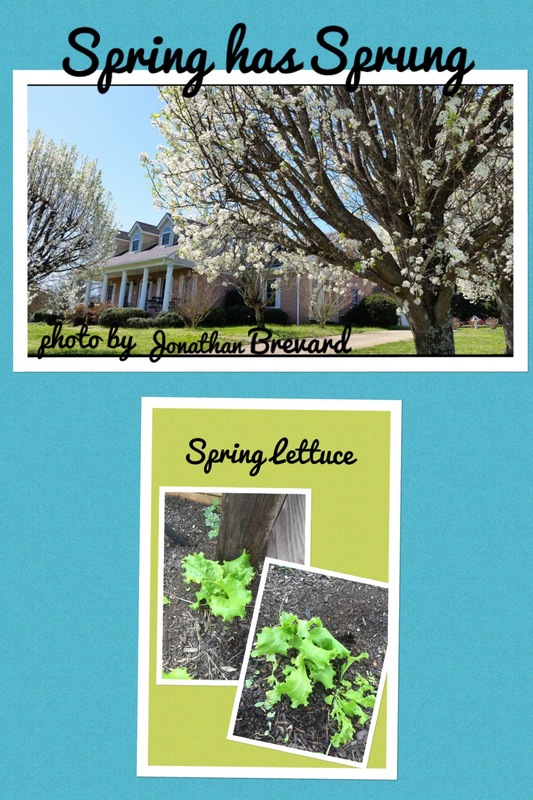 Spring has appeared and you can see it in the flowering trees and the second generation lettuce that is coming up. Deedy loves the outdoors and was so excited to be there. Immediately she started helping me cut the lettuce leaves because she knew we’d wash and use them in something good to eat. As I looked at her I could see myself as I was at her age and felt a presence of my maternal grandmother in me. I could see my grandmother’s brown hair pulled up in a loose bun with dainty ringlets of her hair falling around her face and blowing in the wind. She always wore an apron with pockets. What a good idea! She had an apron for everything. One for the garden and another one for the kitchen and a completely different one for dusting. They came in pretty flower prints and some were solid pastel colors.I guess that’s why I’ve always liked aprons so much. I spent a lot of time with my “Grandma Dessie” helping her in the garden and kitchen like Deedy is now helping me. Here is my grandmother’s wilted lettuce salad and dressing recipe. This cabin in the woods has brought the best part of us out. We can head up at a moments notice now that we keep coffee and extra clothes here. We find the time to read sitting by the fire and playing board games we haven’t done in years. Our grandchildren will find us a challenge next time they play with us! With winter coming to an end we may find ourselves hiking more and taking advantage of all the things there are to do up here but for now we just enjoy the fireplace and the porch view. So since I usually have potatoes on hand and ham in the freezer, I fry them up and we eat and just relax. Of course we go out to eat anytime we want and have all the choices you can imagine. This weekend we brought my brother and since he’s such an outdoors person we decided we should get up early and watch the sunrise. 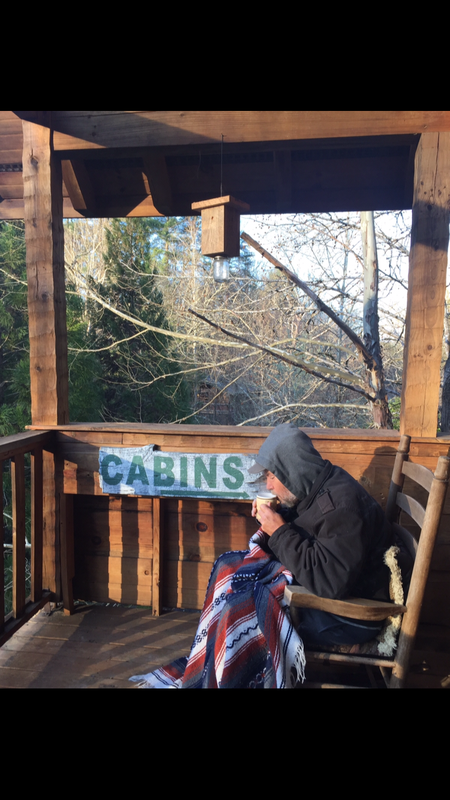 We set the alarm for 6:30, made the coffee and out to the porch we went. Back in for more blankets and refills on coffee and still no sun! Growing up in Ohio and now living in a flat area of Georgia I now understand what mom always talked about when she mentioned the twilight you have with mountains. She grew up the West Virginia surrounded by mountains. The sun slowly creeps up and you have light way before you see the sun. We could have slept in another hour, but then we would have missed drinking hot coffee bundled up with blankets hearing the mountains awake.